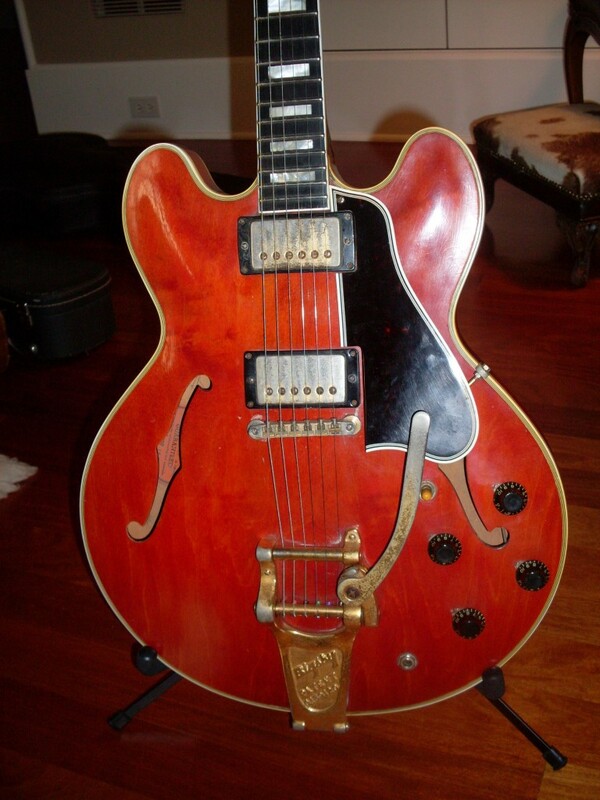 This 61 ES-345 looked pretty darn good but wasn’t quite 100% when I got it. Fortunately, I have a lot of spare parts. Scavengers. There. I said it twice. The guitar marketplace is full of them. It’s the sellers who think you don’t know the difference between a repro part and a real one. 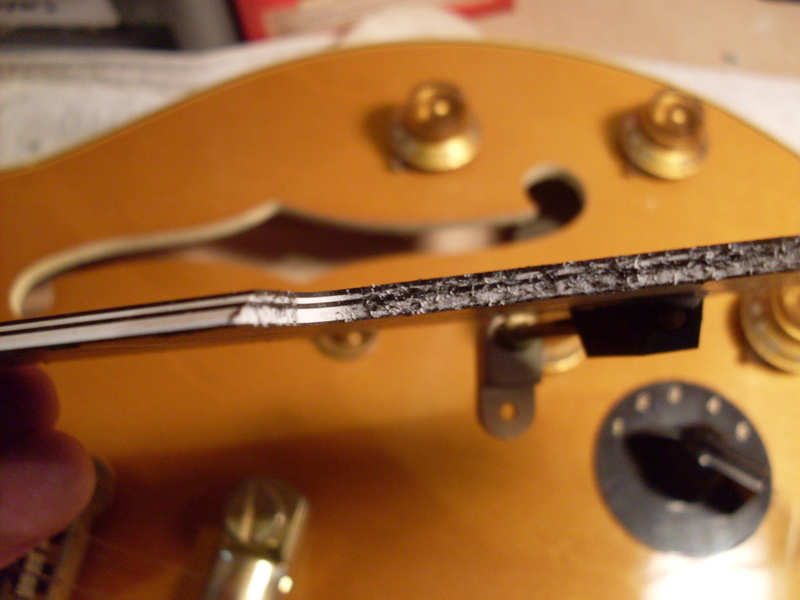 It’s the Les Paul guys who want double white PAF’s and no wire bridges for their R9’s. It’s the parts dealers who know that sometimes the parts are worth more than the guitar. I’m not making a moral judgement here, just putting some facts out there. There are a lot of parts on a vintage guitar. There are a lot of vintage guitar brands and models and variations and nobody knows everything about all of them. I try to know everything about ES-335’s but I learn new stuff all the time, so I don’t know everything either. Take a guitar with around 50 different parts and cook over a low flame for 50 or so years. That’s the recipe for errors and omissions right there. It’s actually a surprise when I get a guitar (often sight unseen) that is 100% untouched. For the high end stuff, I always go in person (even to Europe) and check out the instrument myself. Crapshooting on a 58 or 59 is just too much risk. But I get other vintage pieces from individuals and dealers based on a couple of photos all the time. Want to know how many of these guitar have an undisclosed issue? About 90%. Yep. Nine out of ten. Seem high? Buy ten guitars on Ebay and compare what you get to what was advertised. It’s usually because the seller doesn’t know any better but not always. Sometimes it’s laziness on the part of the seller (or dealer). I’ve been guilty of that myself-you get a guitar that looks just right and you don’t check the pot codes because nothing else has been changed and it’s a huge pain to get in there with a mirror and most of the date codes are covered with solder anyway. Or the tailpiece looks exactly right so you don’t pull it off and check that the studs are the right length. I’m not talking about a changed saddle (virtually all no wire bridge ES’s have at least one) or a changed pickguard screw here or there. Those are cheap and easily replaced. But get a 345 with a repro tailpiece and studs and you’re out $800 or more for the real deal if you want the guitar to be vintage correct. Or you disclose it and lower the price. Repro stuff has gotten awfully convincing and it just makes it harder to spot them. All the more reason to buy from someone who knows the difference. Part of the reason I write so extensively about the real geeky stuff is so that you, as a buyer, know what to look for. Here’s a story about a recent purchase. 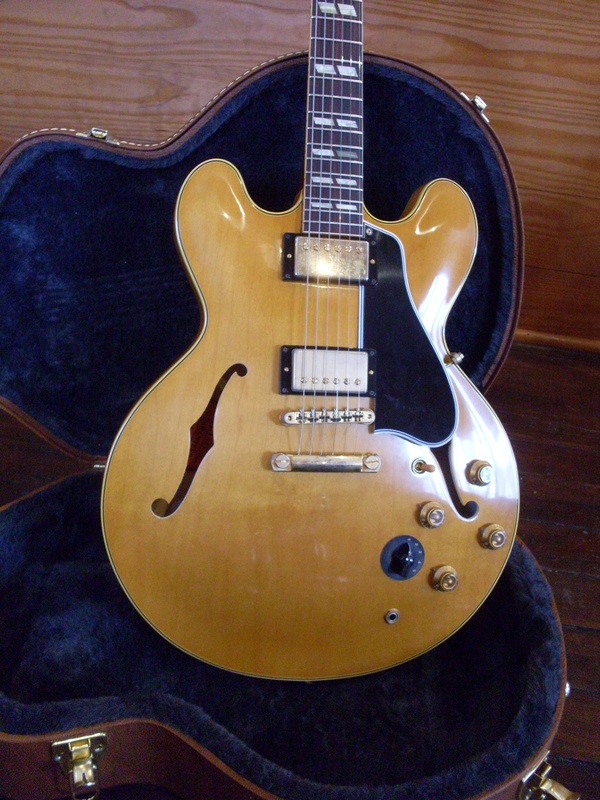 I was contacted by an individual seller with an early 60’s ES-345. I got lots of photos and a very fair price. He said it came from a reputable dealer (a few years ago) and that it was 100% original except for a mono conversion. The photos showed little reason to doubt him. 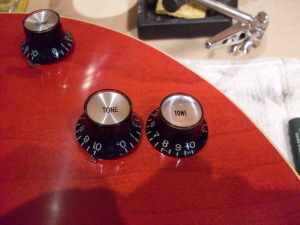 I questioned the tuner tips because it was an early 60’s and the tips looked too good. He didn’t know and so I assumed they were repros (and they were). No big deal-lots of late 50’s and early 60’s ES’s have repro tips. When I got the guitar, it would have been easy to just take the photos and list it as all original except for the tuner tips and the harness. It played great and sounded great and everything looked right. But I’m not that lazy. I pulled the tuners to make sure there weren’t enlarged shaft holes from Grovers (even though there were no marks on the headstock) and I pulled the bridge and tailpiece. Both looked correct at first glance but the telltale “hump” on the tailpiece felt like it was missing. 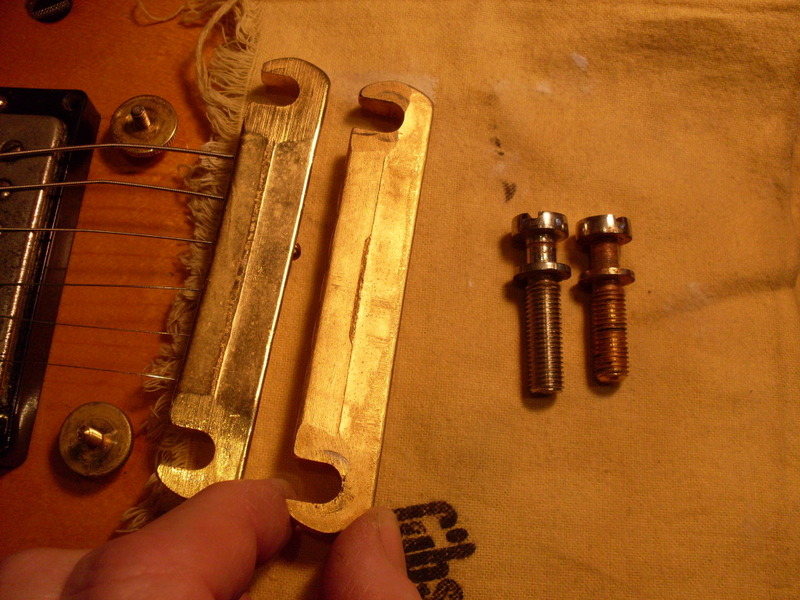 The bridge was correct but the tailpiece was a long seam 70’s probably off of a Les Paul Custom as were the studs-1 3/8″ rather than the correct 1 1/2″. Some people measure the thread length – 1″ for vintage and 7/8″ for later. The seller didn’t know and I don’t expect him to know. He wasn’t a dealer but he had bought the guitar from a dealer. That begs the question…was the dealer lazy? or dishonest? or clueless? That’s the hard part. 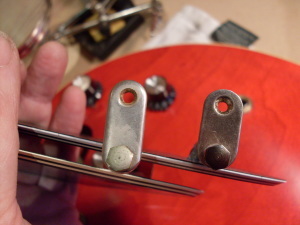 Correct “short seam” tailpiece on the right. Correct “long thread” stud on the left. These parts won’t really affect how the guitar sounds but I’m sure you would rather have the right era parts on your expensive vintage guitar. This late 2014 ES-345 looks pretty authentic and plays pretty well too. There’s still little nitpicky stuff wrong but overall, it’s a very nice guitar. It is over $4000 if you’re buying from the usual discounters. Gibson stickers it over $6000. You would think they could get the pickup covers right. Having gone through the well regarded Warren Haynes 61 reissue, I was anxious to get my mitts on a non artist Memphis reissue. The first one to walk in the door happened to be a 2014 ES-345. Not an inexpensive guitar either. These list for over $6000 and sell for over $4000. The blondes are $4299 at the usual discounters. I’ll start with the nitpicky stuff. The pickguard bracket is wrong as are the pickup covers. The Varitone ring has gold numbers and they should be silver, I think. I’ve actually never had a blonde 345 with a black ring but I’ve seen a couple and the numbers are silver. Easy fix Mr. Gibson. I do think they should know that 345’s didn’t come with plastic strap buttons. 335’s did until 61 but not 345’s or 355’s. That’s a pretty glaring oversight, not that it makes any tonal difference. None of this stuff is a big deal because this isn’t a vintage guitar and even though it aspires to be a reissue, it’s just a facsimile. They could get all of this stuff right but either they just don’t pay attention or they actually don’t do enough research (or they’re too cheap). The switch tip isn’t catalin nor do I expect it to be. It’s amber plastic and it’s inferior to most of the repros out there because it has a big ol’ seam (mold mark). Too much work to smooth it off. They have gotten some big stuff right, however. The body shape is pretty darn good and the 59 neck profile is closer than ever. Still too much shoulder compared to a real early 59 but closer than ever. I would have been surprised if they had done a vintage Varitone and they didn’t. The technology of a 59 VT is clunky and probably too labor intensive to try to duplicate. It is approximately 20 separate components soldered to that 6 way switch. To Gibson’s credit, the tone is right and it looks like they’ve saved some weight by making the chokes much smaller. It’s also mono which will make most folks happy. That earlier version with the two jacks on the rim seemed to make nobody happy. The bindings are finally correct looking after years of getting them wrong. Kudos. And the guitar feels right. I still hate the VOS finish and the really bad aging on the gold hardware. Why is the neck pickup shiny and the bridge pickup dull? Because somebody sweat on the bridge and not the neck pickup? I’ve seen an awful lot of vintage 345’s with all kinds of pickup cover wear but never one that looked like this one. Vintage details aside, it plays extremely well and feels very much like a vintage 345. Tone-wise, the neck pickup really sings but the bridge is a little dull. This may be the guitar and not the pickup. This one is brand new and needs a bit of playing time before I can make a fair assessment. At $4000, it had better be a very good guitar. I’ve bought a few mid 60’s 345’s at around that price and once the reissues start creeping into vintage territory price-wise, it’s time to seriously consider vintage. 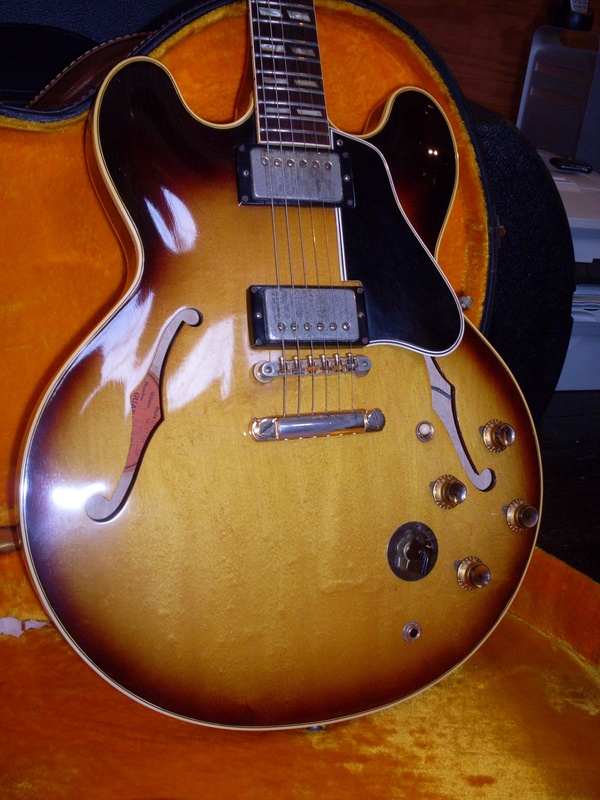 In fact, if you don’t mind the narrow nut, I’d be buying a 66-68 345 before I shelled out $4K+ for a reissue. Of course, you’re out of luck if you want a blonde one. One last complaint. Look at the photo below. That’s some pretty shoddy workmanship. You would think they would take the time to clean up those edges on the guard. This is simply a lack of attention to detail. Unforgivable on a guitar with a $6000 sticker price. 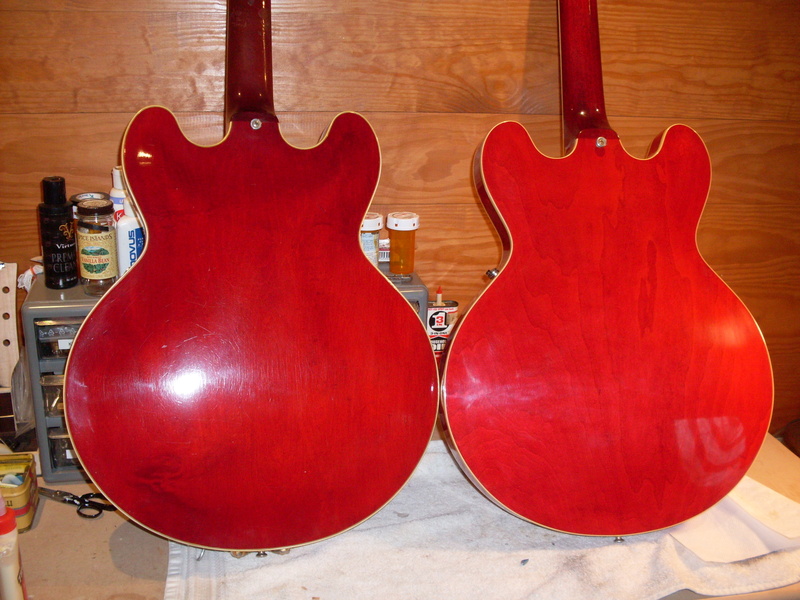 One of these is a real 61 and the other is a Warren Haynes 61 built in 2014. Getting close aren’t they? The doomsayers in the vintage market are saying that it’s only a matter of time before there is no vintage market. The word on the street is that after all of us old guys (you know who you are) either get too old to play or simply die, the market will die along with us. The other word on the street is that the reissues are getting so good that nobody will spend the money for the vintage stuff anymore. As an old guy, my response is that I won’t stop playing until you pry my vintage guitar from my cold, dead hands. I have no plans to die in the next 35 years either (my Dad lived to 95). But the other reason is worth looking into a bit more. I recently took in two guitars that are recent reissues and they are worth commenting on. There have always been a fair number of folks saying how great the Gibson reissues are but I’ve always attributed some of that to commenters who have never played a great vintage one or who just want to feel better about the guitar they bought. I felt that way because I had played the guitars they were raving about and I just didn’t see what they were seeing and I didn’t hear what they were hearing. 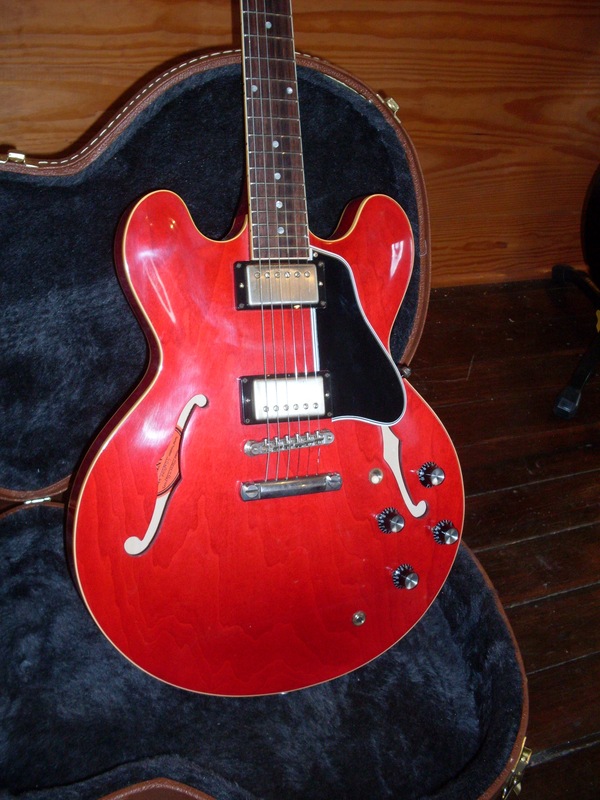 I had a 2006 Nashville ES-335 that was a wonderful guitar but it wasn’t up there with the best of the vintage pieces. I don’t know if the issue was the pickups, the wood or the construction but it just wasn’t as complex, articulate or as “musical” as my old 58. Now, the Memphis built 335’s (and 345’s) are getting a ton of praise and much of it is deserved. I’m not only talking about whether they got all the details right (they didn’t but they are closer than ever), I’m talking tone and playability. Not even close. How tough is it to get the knobs right? That’s a real 60’s reflector on the right. A blind person could tell the difference. Well, I certainly can’t tell the difference here. Not. The vintage one is one the left. My first example is a Warren Haynes ’61 dot neck. It looks like a 61. Really. While they’ve finally gotten the body shape pretty close. Given the variation that the vintage ones have, I don’t think I could tell this from a real 61 very easily until I look at the neck. The way it’s shaped at the headstock is still too sharp and defined-probably because it’s being done by CNC rather than by a human being. They still have some easy details totally wrong like the knobs and the pickguard bracket and, especially, the pickup covers. These are really easy things and it is kind of baffling why they are so far off. But really, who cares as long as the guitar sounds and plays like the guitar it is trying to emulate. One out of two ain’t bad. The guitar feels like the real thing. If I close my eyes, I can be convinced that I’m playing a real 61. But my ears aren’t convinced. Maybe once the wood dries out a bit and a bit more resonance emerges, it will be closer but the guitar sounds a bit one dimensional. It sounds good but it doesn’t sound like the great dot necks I’ve played and loved. You could argue that it’s because the smaller 61 neck doesn’t sound the same as the big 58 and 59’s that I usually play. Fair enough. But I’ve got a 61 here that sounds pretty good and the Haynes isn’t quite up to the challenge. Close. It’s an excellent sounding guitar for sure. I really should get a Rusty Anderson model and compare that. Those are getting some great buzz as well. My feeling is that given a few years and some playing time, these reissues will get better and better. I can’t tell you if they are going to kill the vintage market but I have no intention of buying a load of them and putting them away for a few decades to find out. Next, we’ll look at a new 2015 ES-345 out of the Memphis shop and see how that stacks up. This Haynes 61 is looking like the real thing, sort of. Those pickup covers are an easy giveaway though. The edges are way too round. And that VOS finish…don’t get me started. Star of the show once again is the 59 dot neck. These ran up a good 20% this year and show no sign of weakening in 2015 even with the crappy exchange rates for European buyers. Flame tops are nice too but not a requirement for big bucks. The old guitars that is. Now that 2014 has faded into the rear view mirror, let’s take a minute to see what the year was like for the vintage ES market and what it might look like going forward. First off, don’t look at Ebay asking prices to figure out what your guitar is worth. I can’t tell you how many emails I get that enlighten me about current ES prices. (…there’s a 64 for $100,000 on Ebay…surely my 64 is worth $30K”). Anybody can ask any price they want. I can ask a million dollars for my über rare 59 ES 355 stop tail but I’m not going to get it. Look at the completed listings that actually sold if you want real world sale prices. But even that can be misleading. There are some unscrupulous dealers who will mark a guitar as sold at a high price and then relist it hoping someone sees that a “similar” guitar sold at that inflated price. It happens with relative frequency, so be alert. Or you can just ask me. 2014 was a quirky year. The dot neck market was extremely strong, especially among Europeans until the Euro tanked late in the year. The dot neck market is still strong and should continue to do well. 59’s with no issues are bumping up against $40K with some frequency but the discount for issues has gotten steeper. Folks want no issue guitars when they are spending that kind of money and I don’t blame them. But that makes single issue guitars a bit of a bargain. 59’s with changed tuners can be had in the low to mid $30K range. That’s a big discount for a few little holes that don’t show much. A stop tail 59 with a removed Bigsby with top holes will knock the price down even farther. You should be able to find one under $25K. That’s 15 large for two little holes in the top and four by the end pin. Great if you’re a player. But the no issue guitars are the ones that will lead the market forward. They seem to be getting harder and harder to find. And it isn’t just 59’s that are strong. 58’s (bound and unbound) are right behind the 59’s with prices in the mid $30’s for no issue, clean ones. Early 60 dots with the transitional medium neck are about equal to 58’s. All of these are trending upward at the moment and seem to have done so all year. It’s the thinner neck later 60 and the 61’s that seem to be lagging. Still, it was a good year for dots all around but the thinner necks just seem to sell much more slowly and can’t seem to find their way past $30K unless they are mint. As always, look out for neck issues on the ones with the thinnest necks. Interestingly, I sold more dot necks than block necks in 2014. That’s a first. It seems that the market for 62-63’s with the thinner necks is slow. Folks want big necks, although I’m not entirely sure why. There is, of course, the school of thought that big neck guitars sound better. My experience doesn’t prove that but it doesn’t disprove it either. 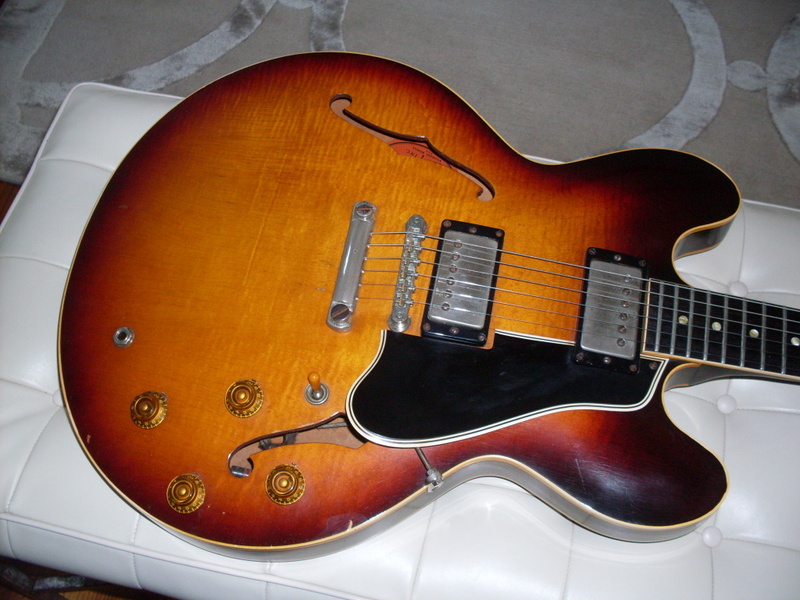 One of the best I ever had was a 62 (dot) with a pretty small neck. However, the rest of the top five are 58’s and 59’s. The continued strength of late 63’s and 64’s comes as no surprise then, what with their near perfect neck profiles and consistently excellent tone. Prices for 64’s have definitely crept up-especially stop tails but also Bigsby/Custom Made models. Reds still outsell sunbursts by a wide margin. A really good no issue stop tail red 64 has pushed back to close to $20K at retail. Just a year ago, it was pretty easy to find one in the $16K range. Now the Bigsby/CM’s are in that range. That’s about a 20% increase in just the past year. Pretty impressive. The bargain still remains the big neck 65. You should be able to find one for $8K or less. Just make sure it’s really a big neck. Most sellers don’t know how to read a ruler. Ask for a photo with the ruler or calipers in the shot. I’m going to skip ahead to 355’s. Mono 355’s have gone nuts. They are hard to come by and don’t last a week when I get one. It doesn’t matter what year either. The 65’s I had this year (wide nut) went just as quickly as the 59’s. Less money, for sure, but still extremely popular and desirable. Expect to spend up to $20K (or even more for double white PAFs) for a 59/60 long guard and in the mid teens for 61-64’s with Bigsby’s. Maestros are less. 65’s are still well under $10K but still strong. We’ll wait for the next post to talk about the stereo 355’s and 345’s. We’ll also take a look at the rarities and at the big issue guitars with refinishes and repairs. That market is pretty interesting as well. Mono 355’s were a big item in 2014. I buy every one I see as long as the sellers leave a little room for me to pay the rent. I’ll take a half dozen 59’s, sir. I know, the neck pickup is upside down. I fixed it.